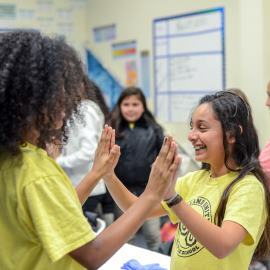 Oakland Unity Middle School uses four learner-centered strategies to achieve our goals of closing the achievement gap and teaching and encouraging students to learn how to learn. We leverage technology to individualize and differentiate instruction whenever possible. When this strategy is fully realized, every discipline will have an element of personalization with student choice about what to work on, and when or how to work on it. Our teachers routinely make use of small-group instruction to tailor instruction. These small groups are based on student data gathered from the use of our various technology platforms, formative assessment results, student observations, and student conferencing. 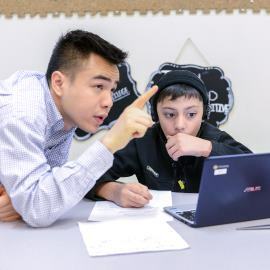 Our students and teachers curate learner profiles, which students not only present to their families at our twice-yearly student-led conferences, but also utilize on an ongoing basis throughout the school year to make choices about what goals they are going to set over a variety of time periods. 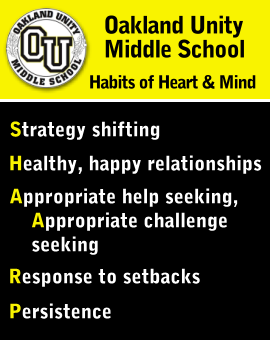 These learner profiles give students ownership of their own data, goals, and growth. Finally, students will have evidence in their learner profiles of the authentic work that they’ve completed through project-infused learning. 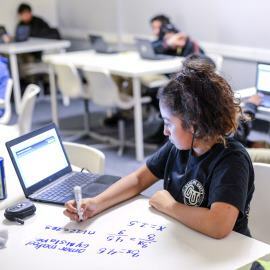 These projects give students opportunities to apply the skills that they learn using our online platforms and bolster through small-group instruction. These projects also allow students to demonstrate their SHARP Habits and continue to grow as collaborators. When fully realized, these projects are interdisciplinary and are a means for our students to engage with the community. OUMS operates an extensive after-school program for all our students. Both academic enrichment and recreation activities are offered. Here is a typical day of Edwin at OUMS. Edwin enters school at 8:25 am and heads to his Morning Meeting with his Advisory — a group of 20 other 6th graders with whom he meets twice daily. On the board in the classroom is a Morning Meeting message about growth mindset, encouraging students to reflect on how their hard work has led to gains in academic, athletic, or social areas. Edwin takes part in a Greeting, in which he is greeted by name by his peers, and then in a Sharing, in which he gets to either share something about his life or listen to others share about theirs. Each of these activities helps him feel connected to the school community. At 8:45 am, Edwin and his advisory classmates transition to their Humanities class. In this class, Edwin practices an ELA skill like understanding an unknown vocabulary word from context in a book that he has selected based on his interests and reading level. Edwin can identify his reading level and can tell why he has chosen the book he is reading. At times when he is more interested in nonfiction, he uses an online platform to select an article to read and practice this particular skill. While Edwin and the other students work independently, his teacher pulls small groups of students to work on discrete skills. His teacher selects students to pull based on digital exit tickets that students completed at the end of the previous class period. Edwin uses his Chromebook to consult his learner profile located in his Google Drive to remind himself of the achievement goals that he has set for his upcoming benchmark, happening next week. Halfway through the 140-minute ELA block period, the class transitions into Project Time. The teacher calls the students together to review the steps and benchmarks that each team needs to reach during the period in order to be on track for the impending authentic assessment, a presentation to members of the community. The topics and methods of presenting to the community have been completely designed and implemented by the students, with the teacher there as a mentor and coach. The current cross-curricular project is about the immigrant experience and incorporates elements of the social studies curriculum. Student teams operate with a team-created contract and give each other feedback on collaboration skills by using the Unity teamwork rubric. At the beginning and end of each session, students use an Action Items sheet to hold each other accountable for getting tasks done. At the end of this block, Edwin transitions to lunch and then to an afternoon Advisory period that is focused on his social-emotional development and establishing and strengthening his connections with peers and the teacher. Following Advisory, Edwin heads to Learning Lab, a class that he attends four times per week. He has a choice over what he wants to work on during the period and he starts Learning Lab by setting a mini- SMART goal on what he would like to achieve during this period. This SMART goal is connected to his larger semester-long goals. After goal-setting, he plans out how he will use the time during the period to reach this goal. Today, Edwin decides that he would like to work towards his math goal (to obtain mastery on the Standard 6.EE.1 Quiz by Friday) and that he will use Khan Academy to practice the skills he will need to pass his next math test — a test that he will take when he indicates to the teacher that he feels he has achieved mastery. He works independently on his laptop with guidance from peers and the teacher as necessary. At the end of the period, Edwin returns to his Learning Lab SMART-goal tracker. He reflects on what he learned, whether or not he achieved his goal, and what factors led to success or failure to meet his goal. He does this using sentence frames provided in the tracker. Today he selects a piece of evidence by using screenshots of his quiz scores to back up his claim that he has met his goal for the period. Finally, Edwin heads to math class. The class starts with a mental math exercise in which students are asked to think through a problem out loud to their peers using mathematical academic language. Students open their laptops and begin working on the topics or skills that they each need to be working on based on their most recent goals. Edwin works on Order of Operations, but the student next to him has already mastered that, so she works on a new topic. Edwin informs his teacher that he will be ready for her to unlock his Order of Operations test on Thursday because he believes that he has gained mastery in that topic. One way Edwin knows that he has gained mastery is when he recently was able to complete five problems in a row correctly on this topic. During the class, the teacher meets with small groups of students. Other students converse collaboratively about the work and ask each other questions if they need help. Edwin does his scratch work directly on the whiteboard table. He also uses a notebook to take notes from a video if he feels like he doesn’t understand a concept. At the end of the regular school day, Edwin may partake in the afterschool program in which students have choices about which electives they would like to participate in (such as art, chorus, theater, martial arts, double dutch, coding, etc.) or may also receive academic support as necessary.